They’re the ultimate in low-water gardening. Succulents store water and grow slowly, making them adaptable to the dry climate of the desert Southwest. Cacti are succulents that usually are small and round and have spines, branches or leaves. Succulents also can have the same characteristics, but the spines don’t arise from a spine cushion, or areole. You’ll only find cacti in the Western hemisphere. The picture that so often comes to mind is the saguaro surrounded by blowing dust in the dry, hot desert. And that’s often where you find cacti, especially here in New Mexico and neighboring Arizona. My husband loves succulents and we enjoyed a trip a few years ago to the Desert Botanical Garden in Phoenix, where we saw so many varieties, most of which couldn’t take the cooler temperatures we have at our higher altitude. There’s at least one yellow bloom left on one of these great barrel cacti at the Desert Botanical Garden in Phoenix. 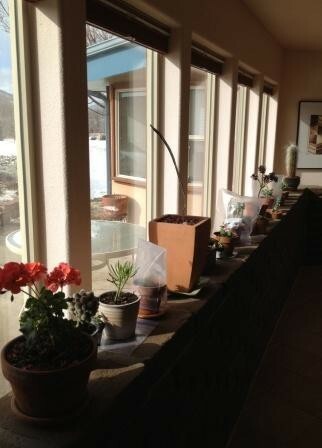 But who says you can’t have succulents at 6,000 feet of elevation? Several natural varieties of succulents thrive in the high desert. Hens and chicks, ice plants, several varieties of agave, and several native plants come to mind, such as prickly pear and devil’s head (also known as horse cripplers). The devil’s head blooms in spring with light pink, papery flowers full of seeds. It’s native to southeastern New Mexico. And you can have all kinds of fun inside your house, assuming you’ve got a good south-facing window, sunroom or greenhouse to winter over potted succulents. I think I mentioned how much my husband loves them? I have a geranium on this wall; the rest of the plants are succulents. He’s even propagating some new ones. We need a greenhouse soon! Yep, that’s a light layer of snow on the ground outside, but the succulents are toasty warm. In case you think succulents are boring, think again. Aside from the many shapes and growth patterns, many of them flower. I’ll try to get some good photos of the devil’s head flowers, but for now, enjoy the delicate blooms on this crown of thorns (Euphorbia milii), which blooms all year long in a sunny location. It started out as a tiny plant from a big-box store and now is about two feet tall (after a nice trim to keep it bushy). There are a few propagating on that trombeil wall, too! The delicate flowers of the crown of thorns. This crown of thorns started out just a few inches tall.